The price of a ticket to the NCAA basketball national semifinals on the secondary market is officially more than $1,000. As of Monday, the average asking price for a ticket to see Michigan-Loyola and Kansas-Villanova was $1,108, according to TicketIQ.com, making it tied with 2015 for the second most expensive of the decade. The price jumped by nearly $200 after the field was set on Sunday night. Also up is the secondary market asking price for the National Championship, which has risen to $619. The average price for tickets for both the semifinals and final is $828, also the third highest since TicketIQ.com began tracking data in 2011. The most expensive Final Four ticket on the secondary market was $1,343 last year to see North Carolina and Gonzaga advance to the title game. On Saturday, college basketball fans will be treated to a somewhat unexpected Final Four. While No. 1 Kansas and No. 1 Villanova will square off in one semifinal – as most expected – the first game pits No. 11 Loyola-Chicago against No. 3. Michigan. Loyola is only the fourth No. 11 seed to get to the Final Four and none of the previous three have won their semifinal. Michigan, on the other hand, brings plenty of history to the floor, having won a national title (1989) and reaching the Final Four eight times. Most recently, the Wolverines got to the National Championship in 2013 before losing to Louisville. The game will mark only the second time a No. 11 and No. 3 have played in the national semifinal (No. 11 George Mason lost to No. 3 Florida in 2006). What most fans know about Loyola at this point has little to do with the game – 98-year-old team chaplain Sister Jean has been making news – and posting plenty on social media – though she admitted she didn’t have the Ramblers getting past the Elite Eight. History may seem to point to Michigan as the obvious winner in this game, but the Wolverines did need a buzzer-beater to get out of the Round of 32. The Ramblers bring a high-scoring offense that shoots 50 percent from the field, so they shouldn’t be easily discounted. Michigan has another high-scoring offense and the spots that could prove tricky for Loyola will be the match-ups with 6-foot-11 center Mo Wagner and 6-8 big man Duncan Robinson. Both teams have multiple scoring threats, so the game should be plenty fun to watch. The other side of the bracket will be a game between March Madness royalty. Villanova won its second of two national titles in 2016 and Kansas has won three times, most recently in 2008. Between the two, the Wildcats and Jayhawks have been in the Final Four 21 times, though Kansas certainly holds the advantage with 15 appearances. In terms of matchup, Villanova leads the nation in points per game with 87, but Kansas also has a high-octane offense. Both teams have leaned on their defense in tougher games. Kansas’ advantage may be that it came out of the Midwest Regional, by far the toughest of the four. UPDATE 3/22 - Compared to previous years, tickets to this weekend’s NCAA basketball regionals are hard to come by. As of Monday, according to data from TicketIQ.com, less than 10,000 seats remained on the secondary market – and only 552 for the Midwest Regional – as compared to as many as 47,000 for the 2014 regionals. Those 10,000 seats are the second-fewest for regionals overall since TicketIQ.com began tracking data in 2011. In 2012, only 7,162 tickets were on the secondary market. The limited availability has helped to keep prices high. The average asking price on the secondary market according to TicketIQ.com data is currently $432, second only to last year’s high of $465. Everything about the 2018 version of March Madness has conspired to pique fans’ interest. Two No. 1 and two No. 2 seeds have been eliminated, two No. 11 seeds remain, and one bracket has a No. 5 seed as highest remaining team in its regional semifinals. For fans interested in picking up last-minute tickets, TicketIQ.com can help. Below is a look at all four regionals, which begin play Thursday and Friday. Virginia, initially considered the best No. 1 seed in the tournament, was eliminated in stunning fashion in the Round of 64. The first top seed to lose to a No. 16 (UMBC), the Cavaliers will have to watch as eight-time national champion No. 5 Kentucky tries its hand at reaching yet another Final Four. On Thursday, the Wildcats will play No. 9 Kansas State, which beat UMBC in the Round 32. The other half of the bracket has two relative unknowns – No. 7 Nevada advanced by upsetting No. 2 Cincinnati and No. 11 Loyola-Chicago dumped No. 3 Tennessee in the second round. This regional is the least expensive of the four and as of Monday, there were still more than 6,500 tickets still available on the secondary market. There’s no No. 1 seed – or No. 2 for that matter – in this bracket either. No. 3 Michigan is the highest – and most experienced seed remaining. Though No. 4 Gonzaga will likely be the crowd favorite on Thursday, the Zags are relative newcomers to college basketball’s elite, busting onto the scene in 2015 with a run to the Elite Eight. Last season, they lost to North Carolina in the national championship. Michigan has a deeper history, winning a national title in 1989 and advancing to the title game as recently as 2013. In between, the Wolverines got to the final two other times and have played in the tournament 10 times since that championship. It would seem likely the two will meet in the Elite Eight – the Zags open the regional against Florida State, which knocked off No. 1 Xavier in the second round, and the Wolverines will play No. 7 Texas A&M, which beat No. 2 North Carolina to advance. According to TicketIQ.com data, the West Regional is the second most expensive behind the Midwest and, as of Monday, just under 1,700 tickets remained available on the secondary market. By far the hottest regional ticket out there, there will be plenty of tournament history at Omaha’s CenturyLink Center starting on Friday. No. 1 Kansas, No. 2 Duke and No. 11 Syracuse have combined for four national championships in the last 15 years. Duke has won two (2015, 2010) and Kansas (2008) and Syracuse (2003) have won one each. That experience will make the Midwest Regional very tough to predict and competitive. Kansas sailed through the first two rounds, winning by an average of 24.5 points, and will play Sweet Sixteen newcomer Clemson Friday in a regional semifinal. Duke-Syracuse, though, may be the more exciting game – it pits two of the winningest coaches NCAA history, Duke’s Mike Krzyzewski and Syracuse’s Jim Boeheim. Availability of tickets on the secondary market, according to TicketIQ.com is very limited – 552 as of Monday – and prices are still climbing. The only bracket that kinda, sorta played out like predicted, both the No. 1 (Villanova) and No. 2 (Purdue) seeds are still playing. And though the Nos. 3 and 4 seeds were eliminated, there are not any double-digit-seeded teams still alive. There are less than 1,000 tickets left on the secondary market for Friday’s tip-off, according to TicketIQ.com, and this will be first time since 2012 that Boston has hosted a regional. Villanova, the 2016 national champion, will be trying advance for a shot at a third national championship (1985, 2016) and No. 6 Florida (2006, 2007) is the only other team in the East to have won a national title. UPDATE - 3/19: Following the 1st and 2nd rounds of the 2018 NCAA tournament, prices for tickets for the Regionals are flat overall. In Omaha, with Kansas and Syracuse driving up demand, prices for the Midwest Regionals are up 34%. Omaha is now the second most expensive regional we've ever tracked behind Sprint Center last year, where Kansas also drove up prices. On the other hand, prices for East Regional tickets in Boston are down 29% while prices in Atlanta (South Regional) and LA (West Regional) are basically unchanged. Looking further down the road, Final Four tickets are up about 10%. March Madness is upon us. And with it, the scramble to fill out brackets and, if you’re near a game site, secure tickets. Be prepared to pay a pretty penny. According to data from TicketIQ.com, the average asking price for a ticket on the secondary market for the First and Second Rounds is the highest in a decade, at $250 across all sites. And the current average asking price for the Regionals is $433, making it the second most expensive in history, behind $465 for last year. Final Four and Championship tickets, currently asking $730 and $573 respectively, will likely rise once the fields are set. The priciest Final Four ticket of the decade, according to TicketIQ.com, was last year’s. Fans paid an average of $1,343 when top seeds Gonzaga and North Carolina advanced to the national championship in Glendale, Ariz. That championship game was the third most expensive of the decade at $695, behind 2015 ($761) and 2016 ($746). North Carolina won. 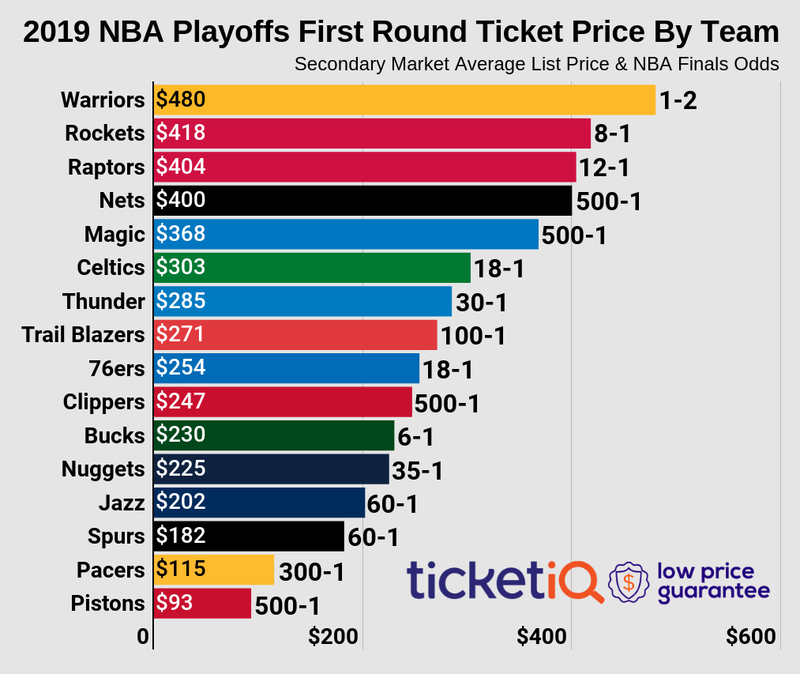 As of Monday some primary inventory for the tournament is also available via Ticketmaster, we laid out the get-in price on the primary market in all the below charts, broken down by round. The below infographic shows the trend over the last nine years between Selection Sunday and the and it it shows, in most cases, prices for the Final Four Drop before drop over the course of the three week tournament. There, are however, exceptions to that rule, as last year and 2013 show. The First Four may not be the sexiest of all the rounds of March Madness, but it’s got some big names this year – Arizona State, UCLA and Syracuse will all travel to Dayton for a shot at getting into the field of 64. It’s not the first time marquee programs have made appearances in Dayton and it is a reason that tickets for this mini tournament aren’t cheap. According to data from TicketIQ.com, the current average asking price for a First Four ticket on the secondary market at of Monday was $119, marking the third time this decade that the price has been more than $100. The most expensive First Four in history was in 2014, when NC State and Tennessee were among the participants. Tickets on the secondary market were $196. The second most expensive First Four ticket was $120 for the 2016 event, and the cheapest this decade was $79 in 2015. For the 2018 version, the secondary market get-in price is $69 while the get-in for remaining primary inventory available on Ticketmaster is starting at $50. The First Four, branded as “The Big Hoopla,” will be played March 13-14. Definitely the most exciting rounds of the NCAA tournament, often with upsets and buzzer beaters, and fans are always willing to pay good money to get a seat to see it live. This year is no exception. The price on the secondary market for a First- and Second-Round tickets on the secondary market will be over $400. According to TicketIQ.com, fans will pay an average of $433 to see the first two rounds of March Madness in Boise. The basket includes perennial powerhouses Kentucky, Arizona and Gonzaga (2017 runner-up). The most expensive ticket to this round on the secondary market was $597 in Seattle in 2015 and the second priciest was $549 last year in Greenville. For the upcoming tournament, the cheapest First- and Second-Round event, according to TicketIQ.com, will be in San Diego, where fans are currently paying $152 per seat. The next cheapest is $197 in Pittsburgh, which features Villanova, Virginia Tech, Alabama, Rhode Island, Oklahoma, Duke, Iona and the LIU Brooklyn-Radford winner. Primary market tickets for the 1st and 2nd rounds have get in prices ranging from $50-$95 on Ticketmaster. Predictably, as the tournament progresses, ticket prices rise. As of March 12, the most expensive Regional Round on the secondary market, according to TicketIQ.com, was the Boston get-together, which was trending on $477, making it the fourth-most expensive of the decade. The most expensive Regional was in Kansas City last year, when the hometown favorite Jayhawks played, and tickets shot up to $652. The third most expensive ticket of the decade was $533 in Cleveland in 2015. There is no truly cheap ticket to a Regional, but the least expensive this year will be for the event in Atlanta, where the current asking price for a ticket is $325. The least expensive since 2011, was $141 in Dallas in 2013. On the primary side, tickets were available on Ticketmaster starting at $137 for the West Regional, $220 for the Midwest Regional, $249 for the South Regional, and $296 for the East Regional. Historically, the Final Four has been the most expensive ticket of March Madness – even pricier than the Championship. This year will be no exception. While the price of Final Four and Championship tickets tend to rise once the field is set, 2018 prices are still following the trend. According to TicketIQ.com, the current asking price for a Final Four ticket at the Alamodome in San Antonio, is running $730 on the secondary market. Championship tickets are trending at $493. For the last three years, the price for a Final Four ticket on the secondary market has been more than $1,000 -- $1,343 last year, $,1025 in 2016 and $1,108 in 2015. The least expensive Final Four ticket was in 2011, when for $552, fans got to see Butler beat VCU and Connecticut slip past Kentucky in the first Final Four in history that did not feature a No. 1 or No. 2 seed. The field was considered the weakest in March Madness history. The get-in price for the 2018 Final Four is $199 on the secondary market. The highest get-in price in history was in 2013 in Atlanta, when fans paid $309 just to get in the door. While the price of a ticket to the NCAA Men’s Basketball Championship game has traditionally been cheaper than the Final Four, it’s hasn’t been cheap. Like the Final Four, ticket prices rise (or fall) based on which teams make the championship, and where it’s located. This time around, championship tickets are trending at $530 with a get-in price of $180 on the secondary market, according to TicketIQ.com. The game will be played at the Alamodome on April 2. The most expensive championship game of the decade was $796 in 2016, when Villanova beat UNC by three points in a tight game in Houston. The title was the second in Villanova’s history. A close second, in terms of ticket prices, was $761 in 2015 while the cheapest title game cost fans an average of $60 on the secondary market in Dallas in 2011. This year, the current get-in price for the national championship is $164.